Gold has retreated quite a bit since its high of $730 on May 11th 2006. Its currently trading around $630/oz. I see this as a good buying opportunity. While I’m against dollar cost averaging, I think gold is in the beginning of a bull cycle and this justifies buying on dips. I recently bought another Australian Lunar Series coin. This time I got the Dog. 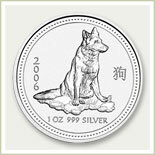 Also got it in the Silver coin and surprizing the species of dog is different on both of them. 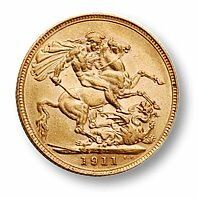 Anyway, I also bought some gold British Sovereigns [around 100+ years old], some French and Swiss francs and an 1873 Danish “Mermaid” Coin. I also bought a 200 yr old gold coin of Napolean Boneparte! [Ok maybe I’m going nuts with this gold coin stuff, but its hard to stop buying those damn things now!] Better stop now before the wife gets upset! I also got a bunch of Silver Eagles. Funny how the price of silver is so low considering that its used in electronics as well as jewellery. Compared to Gold [which in my mind is inherently useless] it hasn’t gone up as much. Anyway I’ll post pictures of them later. 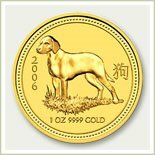 Check out my favorite gold coins.